French general, born of poor parents near Versailles on the 24th of June 1768. At sixteen years of age he enlisted as a private soldier in the Gardes françaises. He spent his entire leisure in earning extra pay by civil work, his object being to provide himself with books, and this love of study, which was combined with a strong sense of duty and personal courage, soon led to his promotion. When the Gardes françaises were broken up in 1789 he was a corporal, and thereafter he served in various line regiments up to the time of his receiving a commission in 1792. 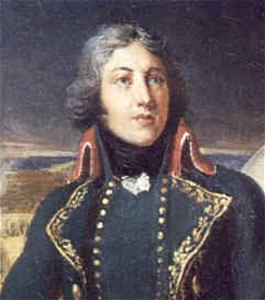 In the defence of Thionville in that year Hoche earned further promotion, and he served with credit in the operations of 1792-93 on the northern frontier of France. At the battle of Neerwinden he was aide-de-camp to General le Veneur, and when Dumouriez deserted to the Austrians, Hoche, along with le Veneur and others, fell under suspicion of treason; but after being kept under arrest and unemployed for some months he took part in the defense of Dunkirk, and in the same year (1793) he was promoted successively chef de brigade, general of brigade, and general of division. In October 1793 he was provisionally appointed to command the Army of the Moselle, and within a few weeks he was in the field at the head of his army in Lorraine. His first battle was that of Kaiserslautern (28th-30th of November) against Prussians. The French were defeated, but even in the midst of the Terror the Committee of Public Safety continued Hoche in his command. Pertinacity and fiery energy in their eyes outweighed everything else, and Hoche soon showed that he possessed these qualities. On the 22nd of December he stormed the lines of Fröschweiler, and the representatives of the Convention with his army at once added the Army of the Rhine to his sphere of command. On the 26th of December the French carried by assault the famous lines of Weissenburg, and Hoche pursued his success, sweeping the enemy before him to the middle Rhine in four days. He then put his troops into winter quarters. Before the following campaign opened, he married Anne Adelaide Dechaux at Thionville (March 11th, 1794). But ten days later he was suddenly arrested, charges of treason having been preferred by Pichegru, the displaced commander of the Army of the Rhine, and by his friends. Hoche escaped execution, however, though imprisoned in Paris until the fall of Robespierre. Shortly after his release he was appointed to command against the Vendéans (21st of August 1794). He completed the work of his predecessors in a few months by the peace of Jaunaye (15th of February 1795), but soon afterwards the war was renewed by the Royalists. Hoche showed himself equal to the crisis and inflicted a crushing blow on the Royalist cause by defeating and capturing de Sombreuil's expedition at Quiberon and Penthièvre (16th-21st of July 1795). Thereafter, by means of mobile columns (which he kept under good discipline) he succeeded before the summer of 1796 in pacifying the whole of the west, which had for more than three years been the scene of a pitiless civil war. After this he was appointed to organize and command the troops destined for the invasion of Ireland, and he started on this enterprise in December 1796. A tempest, however, separated Hoche from the expedition, and after various adventures the whole fleet returned to Brest without having effected its purpose. Hoche was at once transferred to the Rhine frontier, where he defeated the Austrians at Neuwied (April), though operations were soon afterwards brought to an end by the Preliminaries of Leoben. Later in 1797 he was minister of war for a short period, but in this position he was surrounded by obscure political intrigues, and, finding himself the dupe of Barras and technically guilty of violating the constitution, he quickly laid down his office, returning to his command on the Rhine frontier. But his health grew rapidly worse, and he died at Wetzlar on the 19th of September 1797 of consumption. The belief was widely spread that he had been poisoned. but the suspicion seems to have been without foundation. He was buried by the side of his friend Marceau in a fort on the Rhine, amidst the mourning not only of his army but of all France.